This morning while I was catching up on the very little sleep I got last night, Matt took Andrew to get a ride in a real crane. Matt's step-dad operates a crane in town and took Andrew to his job site this morning. 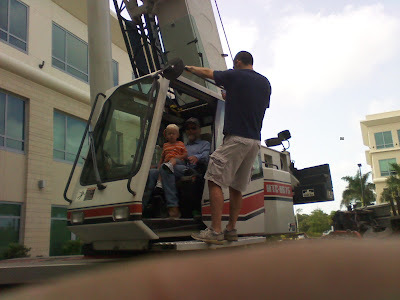 Of course Andrew loved sitting in the crane, pushing all the buttons and of course Grandpa loved it too!